Whether you want to be Ringo Star or Lars Ulrich, you prefer Jazz or Hip Hop, drumming is your hobby or aspiration, you will be hard-pressed to find a better start than the first digital textbook from the Drum Syllabus Series. 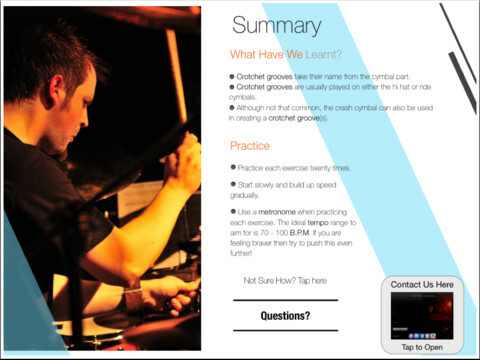 A drummer’s bible, DSS 1.0 is a fantastic iBook which contains all the information to get you started on your drumming path. 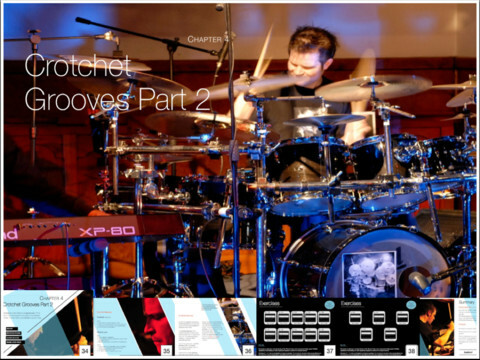 Philip Page, the author and a professional drummer, introduces the iBook with a twist on the famous idiom, “perfect practice makes perfect.” He explains: practising in a “perfect” manner, which although may take longer, will eventually make you perfect drummers. And in this book you will find plenty of exercise pieces and tips on how to play those. The introduction also explains how to use the book, drum notation, musical terms, and right-handed and left-handed drum set-up. There are ten chapters in the book, focusing on Grooves and Fills. Each chapter is simply written with clearly defined technical terms so that even the non-musicals can understand it. The chapters end with an exercises section which has as many as ten études. 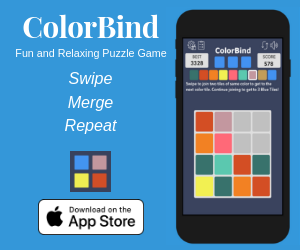 Tap to open each piece and practice what you have just learnt. 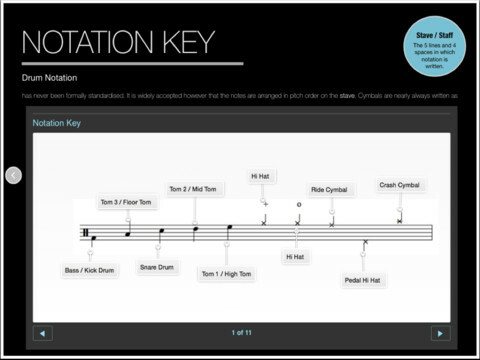 You can also play the piece in 70 BPM and 100 BPM tempos to hear what it sounds like. At the bottom of the page you’ll find Top Tips on how to attempt these études. My favourite is the “Taking It Further” section. In this, you get to watch and hear popular songs which use the drumming techniques explained in the chapter. The star of the book is Song Breakdowns. This contains the breakdowns of all the songs suggested for listening in the previous chapters. Each breakdown is accompanied with a little bit of information and how to play it. I had a great time trying out Adele’s Rolling in the Deep on my son’s beginner’s drum set. DSS is a highly interactive book which makes it fun to read. Each chapter and section is clearly marked. 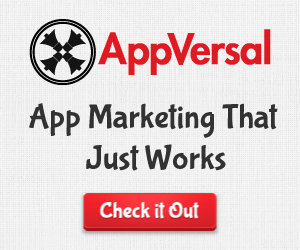 The pages contain only as much information as you need and are not over-crowded. Before the beginning of each chapter you get the definitions of the relevant terms which are repeated in little bubbles on the top-right of the pages for quick access. 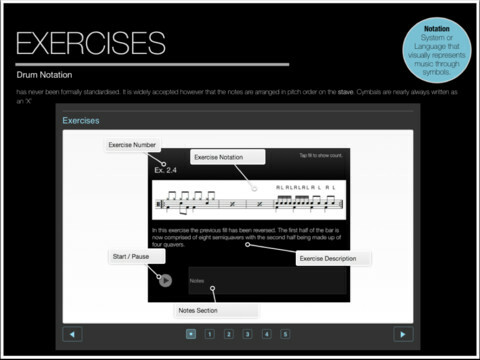 The practice pieces are neatly displayed with the ability to add notes for each exercise. These can be revisited through the “Chapter Review” tab at the bottom-right of the Exercises section. 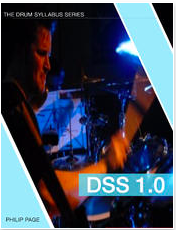 DSS is a must-have App for any aspiring drummer. The writing is not only informative but also very encouraging. If you’re just starting out, DSS is a great place to begin. And even if you’re taking lessons, DSS can be a great companion to help you practise. 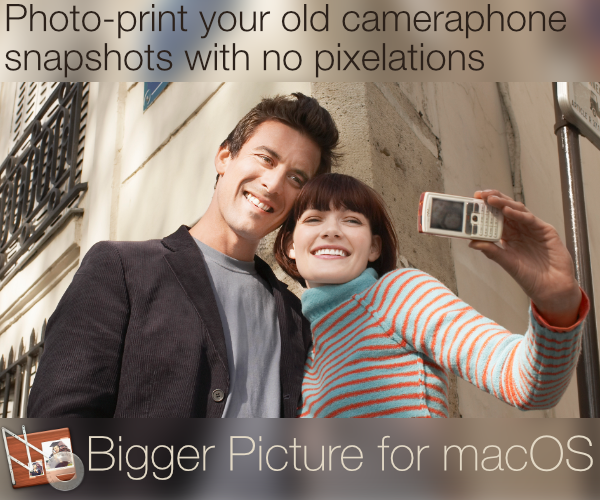 You can download DSS for only £9.99 for iPad and Mac from here.